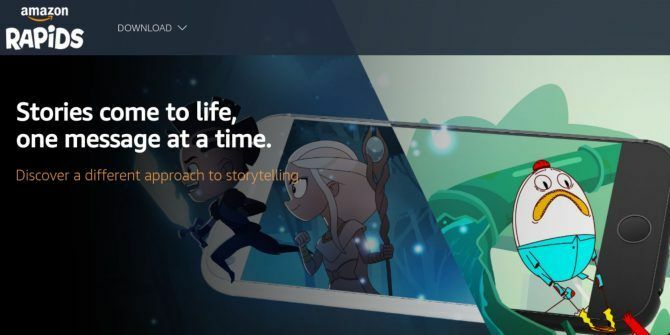 Amazon Rapids is just one of a number of chat stories apps 8 Chat Stories Apps for Reading Fiction on Your Phone 8 Chat Stories Apps for Reading Fiction on Your Phone If you're interested in reading chat stories, we've picked out a handful of outstanding chat stories apps that you'll love. Read More to have popped up in the past few years. These all allow you to read short fictional stories on your smartphone, with the tales being broken up into bite-sized chunks. Explore more about: Amazon, Reading. Amazon Music Is Now Free for Amazon Echo OwnersEmby vs. Plex: Which Is Better? I fully disagree here! When you compare the two for audio streaming emby is far ahead. Time and time again I try to play a video over the network with Plex and no sound. In some cases, you can change the audio to a different type however for a lot of TV and movies only one audio. In every case that Plex hasn't work for audio emby has works just fine. Also for Plex, I continuously see that mkv movies continue to transcode where in emby the movie plays direct without issue. Note all of my testing has been done from the xiaomi mibox.